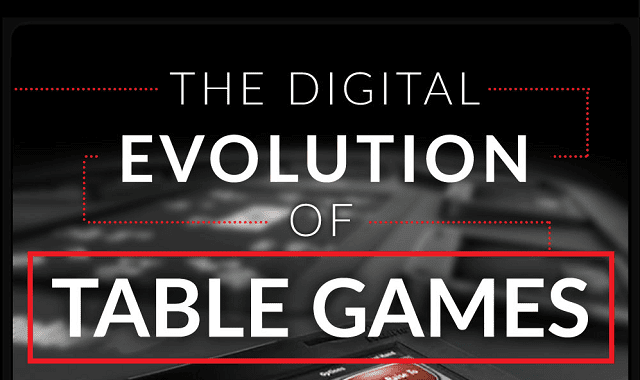 The Digital Evolution of Table Games #infographic ~ Visualistan '+g+"
Over the years, you may have noticed that casino games have changed and are different today compared to how we knew them ten years ago. From blackjack to baccarat, poker to pai gow, many casino games that we all love and enjoy are evolving and adapting to the digital age! The Plaza Hotel & Casino, located in Downtown Las Vegas, put together this infographic showcasing how these traditional table games have gone digital and revolutionalized the gaming experience. Currently, most popular table games on the casino floor (especially Poker) have incorporated digital elements to the game or have been given an entire digital makeover. Many of the more inexperienced gamers find this a welcome change with less pressure from a dealer and pit boss while other seasoned gamers still revel in the real life experience at the traditional tables. How about you? Which experience do you prefer? Check out this infographic to see the ways in how things have changed!